Abby the Librarian: The Libs! They are Mad! Step 1: I like to read a story first and then bring out the Mad Libs version. I think the Mad Libs story is fun nier if you've heard the original book. So pick out a book and then take a passage from it (this can be as long as you like, I usually do 4-7 sentences, whatever will fit on one sheet of paper). Type up the passage and select words to omit. In my experience, the more guidance you can give them the better (especially with younger kids), so ask for "a body part" or "a musical instrument" instead of "a noun". Verbs seem to be the hardest words for them to come up with, although you might make it easier by saying "something you might do in the park" or "something you might do at school". **If you're doing Mad Libs on a large piece of paper for a whole group to see, you'll want to make a cover for your story so kids can't see the story while they're giving you answers. I also created covers for the smaller papers I bring on outreach storytimes. The following steps will show you how I create them, but there's no reason you couldn't just write the words on a separate sheet of paper and skip the cover if you prefer! 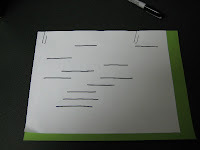 Step 2: Print out the passage you created and place a blank piece of paper on top of it. Trace the lines with a marker or pen. Step 3: Paperclip your paper with the lines on it to a piece of construction paper. Make sure you get the papers lined up in the corner. 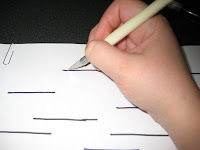 Step 4: Use an Exacto knife to cut through each line. 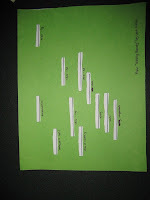 Then take the top paper off and cut out boxes where each line is. Step 5: Put the construction paper on top of your print-out of your Mad Libs story. The boxes should be cut out right where your omitted words are. Underneath each box, write down what kind of word you need for that box (verb, adjective, noun, etc.). 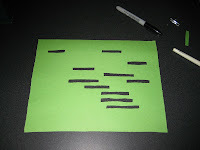 Now, I use this for outreach storytimes, but you can also make a giant one to share with a group by writing the story on a giant piece of paper or using one of those giant pads of paper where you can flip the paper over. I also laminate the story sheet so you can use a dry erase marker and reuse the same sheet over and over. I've done Mad Libs with several different school-age groups and it's always been a fun activity to include between books! What a cute, fun idea! Abby, you give me more ideas for my file...!!! What a great idea, Abby. Do you think this would work for preschool age (3-4), as well? If not, do you have any ideas for stratchers for this age group? Bridget, I've never tried the Mad Libs with preschoolers but I think it might go over their heads. Many of the elementary school age kids have seen actual Mad Libs before and know a little about how they work. Thanks, Abby. That is very helpful. I've been an avid reader of your blog since I discovered it. I'm studying to be a public librarian with an emphasis on children and young adults. Greetings from the Royal Oak Public Library! 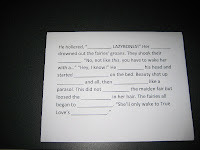 In the past, we did Mad Libs with the teens for our Anti-Valentine's Day party and it was a HUGE HIT! We found a fill-in "break-up" letter online to use for our Mad Libs. Stephanie, that is such a great idea! I am totally stealing it. What else did you do at your anti-Valentine's party? ?